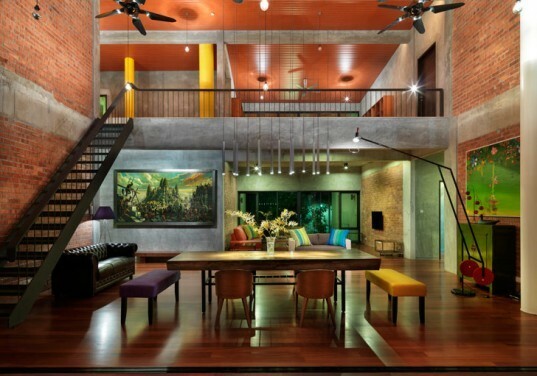 In the suburb of Petaling Jaya, Selangor, Malaysia, a new sustainable home is pushing the limits of preservation and efficiency through the use of reclaimed materials and reducing the carbon footprint through passive and active energy systems. 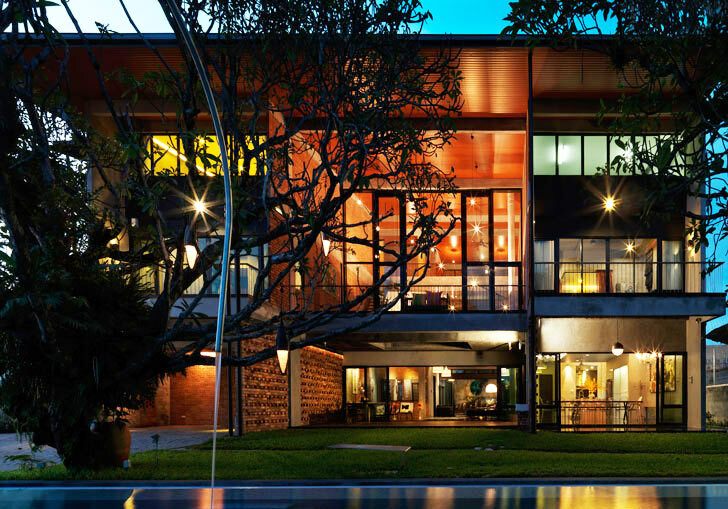 Known as the S11 House, Malaysian architecture firm ArchiCentre teamed up with contractor Atlantic Builders to complete this sprawling home as a Platinum Level residence based on the Malaysian Green Building Index. S11 House is a 12,000-square-foot home that is designed based on the characteristics of a tree in the tropics. The roof is a large, insulated canopy made from recyclable steel metal sheets coated in a light white paint, which minimizes heat absorption. Roof insulation was also used made from 200mm thick rockwool and two layers of reflective foil. Ventilated air space also separates the metal roof from the rockwool. ArchiCentre made sure that the home’s roof protected the residents of S11 House, but in a way that didn’t compromise sustainable building practices. Though the home is large, ArchiCentre found a way to minimize energy consumption and shrink the carbon footprint to resemble that of a small home. Through active systems, such as the 5 KW photovoltaic array mounted on the roof, the home manages to generate enough electricity to even sell back excess to the national electric grid. The home is also designed with a series of wind turbines combined with glazed pyramids that create “stack effect” ventilation due to temperature differentials. This helps to keep cooling needs low. Blackwater is treated onsite; rainwater is collected and harvested; and compost is collected for the gardens in the backyard. The list of sustainable features seems to be recorded as if the architect checked every box in the “green building” textbook. Many of the homes materials were reused from the demolished 1960s-era house that previously stood on the site. Old concrete roof tiles were crushed for gravel fill, clay bricks were cleaned and used as feature walls, steel was sold off to local manufacturers, and roofing timbers were used for formwork. In the end, the interior of the S11 house has bare, natural finishes that complement each other very well. 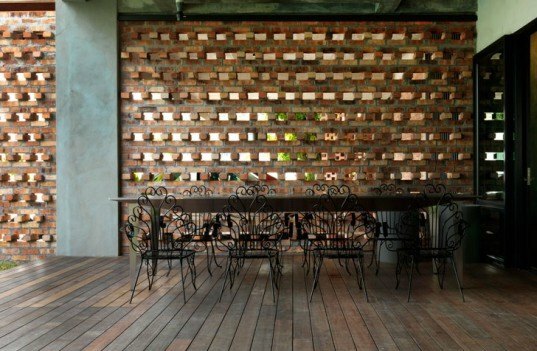 Concrete, common red clay tiles, FSC-certified timber flooring, and cement plaster are all exposed with minimum paint. ArchiCentre is emerging as a young powerhouse for design in Malaysia. The firm recently won the Malaysia Young Architect Award in 2012 and continue to be featured in magazines and blogs all over the world every month. S11 House was the Residential Architecture award winner for Futurarc Green Leadership in 2012, and won multiple awards of excellence by PAM Awards in 2011. Blackwater is treated onsite, rainwater is collected and harvested, and compost is collected for the gardens in the backyard. The list of sustainable features seems to be recorded as if the architect checked every box in the “green building” textbook. Many of the homes materials were reused from the demolished 1960s-era house that previously existed on the site. Old concrete roof tiles were crushed for gravel fill, clay bricks were cleaned and used as feature walls, steel was sold off to local manufacturers, and roofing timbers were used for formwork. Concrete, common red clay tiles, FSC certified timber flooring, and cement plaster are all exposed with minimum paint. S11 House was the Residential Architecture award winner for Futurarc Green Leadership in 2012, and won multiple awards of excellence by PAM Awards in 2011. Through active systems, such as the 5 KW photovoltaic array mounted on the roof, the home manages to generate enough electricity to even sell back excess to the national electric grid. The home is also designed with a series of wind turbines combined with glazed pyramids that create “stack effect” ventilation due to temperature differentials. This helps to keep cooling needs low. Though the home is large in size, ArchiCentre found a way to minimize energy consumption and shrink the carbon footprint to resemble that of a small home.